PMA is pleased to highlight Doug Johnson, president, Marion Manufacturing Co., Cheshire, CT. As a leader in progressive stamping and precision metal components, Marion Manufacturing handles orders from specialized low-volume custom components to high-volume commodity parts. 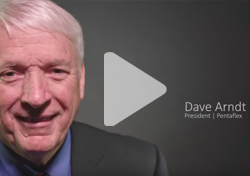 Read Doug's thoughts about game-changing metalforming technology, what is on his wish list for his shop, and more! 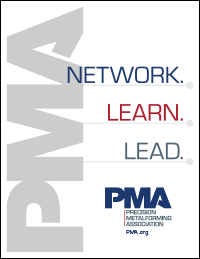 A: Membership at PMA offers many benefits to companies the size of Marion Manufacturing but the most valued at this time is networking. Membership in the Press Club networking group has been invaluable to the company. The interaction between members and the takeaways from our meetings help set the direction we take in many aspects of our business. A: Having just installed a new high-speed Minster Kyori press at the end of 2016, we have moved our focus for 2017 into our toolroom. On our wish list is a new wire EDM machine to replace two aging units. This will allow us to increase our capabilities in prototyping and tool building. A: Additive manufacturing is the fastest growing technology that we are watching closely. The capabilities of 3D printing when it comes to rapid prototyping is a game changer. I’m excited to see what new capabilities arrive in 2017. A: The Forming Our Future agenda for 2017 is a close match to my perfect agenda. I would add workforce development as my number one agenda item, followed by the planned session on rebranding manufacturing. We need to more accurately portray who we are in the eyes of our future workforce. A: My father always told me that if you want to be successful in life you must be a good moral and ethical leader with your family, friends, employees and customers. If you do this, you will always be able to look in the mirror and like who you see. A: 1. Bill Belichick – How do you get the best out of people who have not performed for other teams. 2. Ronald Reagan - Reaganomics and leadership skills. 3. John Wayne – Childhood hero!